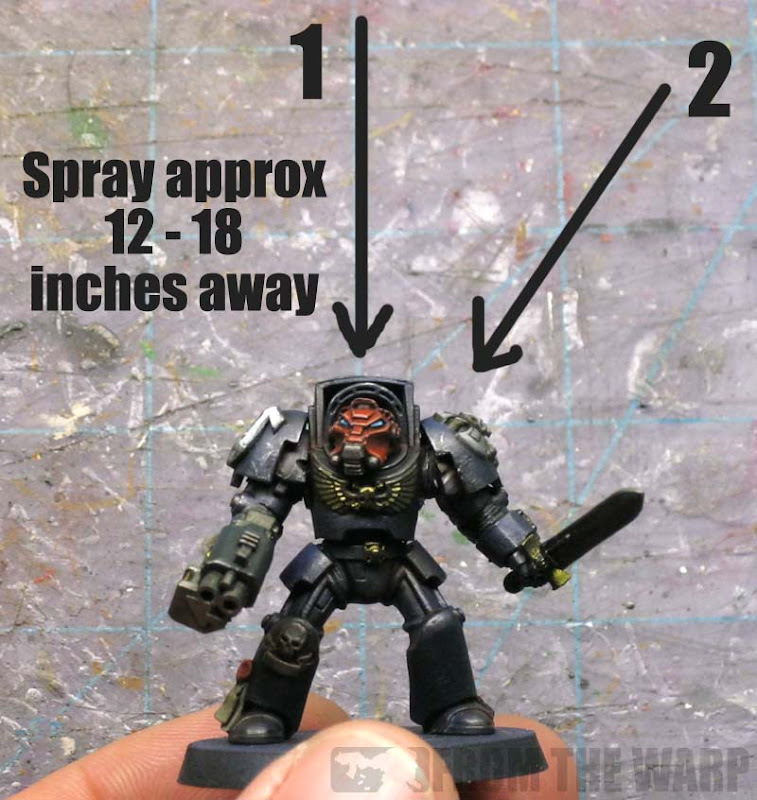 When I posted my Dark Angels power armoured troop the other day, I got an email asking about the actual spraying process I use to apply the split basecoat. It's not terribly difficult to do and I used it once before on my Ultramarine terminator shown above. After a little trail and error, I found a way that works really well for me. The first thing you need to keep in mind is that your two colors need to be somewhat close in terms of value. I don't think this will work that well with white and black. You need to have a dark color and black. The value range between the two colors cannot be that far or the blending will not be very smooth. The further you are apart, the trickier it gets. That being said, I've done this twice. Once with dark blue and black and a second time with green and black. Spraying the model is easy enough. I have two positions I spray for this effect. The first one is directly overhead. The second one is slightly off at an angle. Not very far though. You still want to be applying spray paint from an overhead position. The same rules apply here as they do with all spray paint... shake well, don't do it in a hurricane, keep the distance between the can and model consistent and never start or stop spraying directly on the model. With the first spray from directly overhead, I am looking to get complete coverage with my second color. I may make a few passes until I have no more black showing. With my second spray at a slight angle, I will look at the model and only do this on the areas I want to add a little more color to. Looking at the model directly overhead, you can see that most of the model is covered. This second pass is to bring some of that color down onto the model. I'm not going for complete coverage with my second spray. More like the suggestion of additional color here and there to break up some of the larger black areas that still remain on the model after the first spray. This second spray really is a matter of taste. Using this approach, I will wash my model with a similar colored wash to tie both colors together and help with the blending. You may want to go slightly heavier with your spray paint overall so that you can darken it down as you want. It's much easier to darken the model with washes than it is to try and bring that spray paint base color back up in value. I use cheap spray paint. I look for the color more than anything else. If I can find the exact color I need, I go with it. And... it doesn't matter if it's gloss or not. Once you apply a few washes overall and varnish it in the end, you'll never know the difference. In fact, the Dark Angel I painted like this was done with gloss green spray paint. If you're going to try this, do a test model or two until you're happy with the final results. Once you get a feel for how much spray paint you need to apply, you will fly through a unit of troops in no time at all. Hrm, this may be a method to test out on my Dark Angels, I would love to crank them out in record time. It may not be exactly what you're after but look for Army Painters 'Alien Purple' I've used it on my own chapter and have been able to knock out marines pretty fast. Granted they're not as well done as Ron's but for table top they're alright! It's the same way I did all my planet strike and city fight terrain. Great post Ron! Try it out on terrain first if your nervous as that stuff is more forgiving! 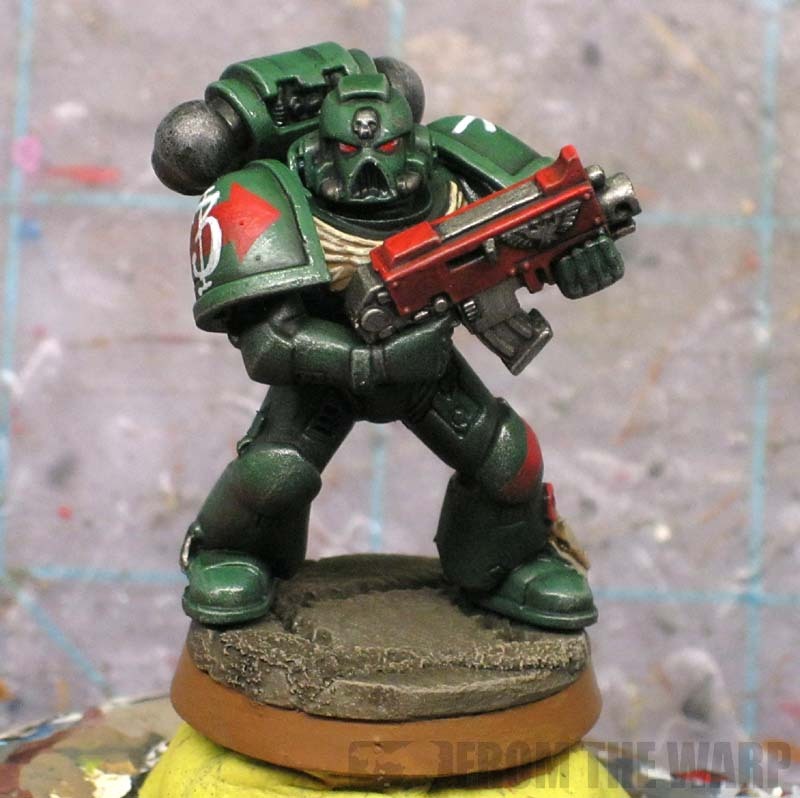 I have just found your blog in the last little while and I have to say I love all the painting tips. Great work man keep it up. The gloss paint is even better cause it makes washes flow more easily and get directly into crevices. I don't know where I first got the idea from but I've been doing the exact same thing for a while. I actually thought I was cheating! And also like Zab said, I've spayed terrain like this also. Another quality post Ron, good stuff! styx: This speeds up the process for me, there's no doubt about it. Spray you base coat and then add a few key details. That's it. Victor Engelmartin: Perfect, glad it helps. Civik: I don't know about being an easy button, but it certainly makes it faster once you get the hang of it. ieuan: You could use any color/brand of spray paint. The trick is picking a good color combination that gets the results you want. And it's not cheating by any stretch of the imagination. Zab: I do this on terrain as well! Anon: Thanks for the support. Psish: You know, I never thought about the gloss paint helping with the washes. Kind of like an added bonus then. Ron, the only thing I hate about painting is the time it takes to get a semi-decent base of color on regular troops. I'm willing to go nuts for characters and sgts, but regular troops just takes so long I lose interest. I might be able (might!) to finally finish an army and be happy with it if I can get this to work. Well this will speed up the process for sure then. It's really only tabletop results, but for rank and file guys, this works for me. Very nice article, Ron. It's surprisingly simpler han I thought it would be. I'm considering trying this out with my airbrush instead of a spray can. I might actually affix the model to a backer board or my turntable (repurposed dollar store spice rack) so I can mount it horizontally and at the 40 degree angle required. That way I am not holding the airbrush vertically, and always have the same angle for each model. TheRhino: An airbrush should probably give you much better control overall and produce better blends in the end. I don't get it, what does spraying like this do? Shadows??? Hivetyrant36: Essentially... yes. By spraying the whole model black, we create the shadows. By spraying the second color (the actual color of the armour) from the top down only, we create an artificial overhead light source that appears to show us the true color of the armour and create the highlights. 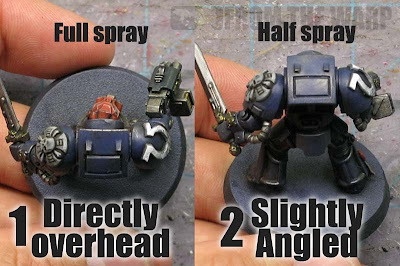 It's a super fast way to do basic highlighting and shading on a model and incorporate that into your basecoat. 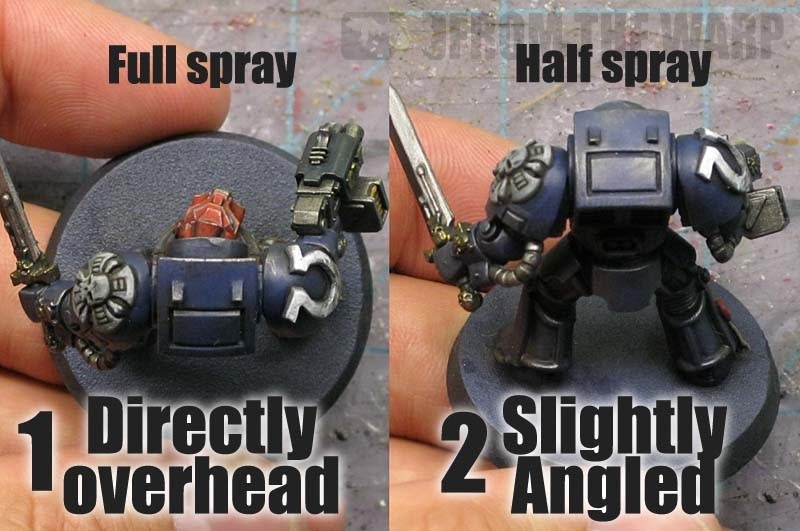 Used this very method for my SW and today on the metal of the grey knights, a good effect for quick, tidy results. Ron, I've started using a variant method of this, thanks to you. Grey primer coat, directional black from the bottom, airbrush on the "actual" colour I want it to be. Pondering throwing in a short burst of white from the top before the airbrushing, but so far, lovin' it. 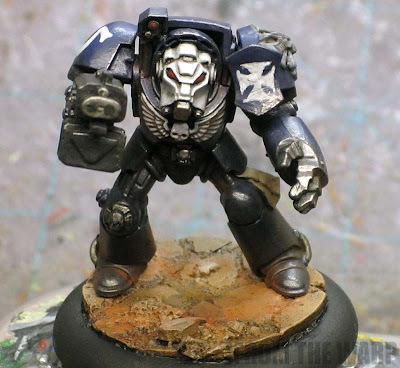 Rick_1138: I can see how this would work perfectly for Grey Knights with the metal over the black. I can imagine that being very fast. Faolan (Jake): Excellent! Even better is that you've taken the idea, made it your own and expanded on it. That's the beauty of it. One day I'll get into airbrushing as well. I did this same thing with an airbrush for my Deathwing. But the bonewhite takes a little bit more of an effort. I started by priming white. Then base coat the entire model light brown with the airbrush. To finish the base color, I airbrushed overhead with bone white. Moron: I'd like to try using an airbrush myself. You have way more control with an airbrush don't you? It sounds like you've got a good scheme for your Deathwing there. Hopefully they turn out killer looking.